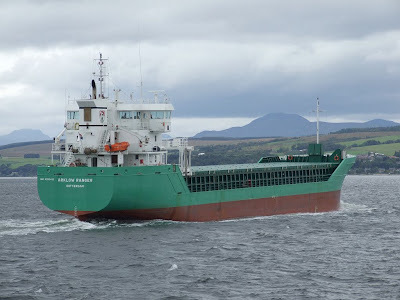 One of the large fleet owned by Arklow Shipping arrived on the Clyde this afternoon, anchoring at the Tail o' the Bank before heading upriver to Glasgow to load scrap metal. This vessel, ARKLOW RANGER, was built in 2002 and is registered in the Netherlands, like many of Arklow's fleet. She is 89.95 metres long, and of 2,999 gross tons. Her deadweight is 4,581 tonnes.